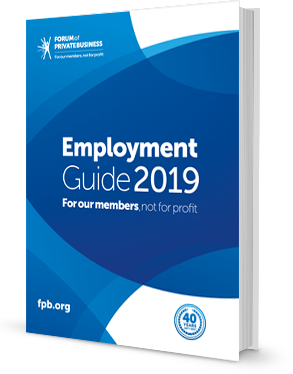 The Forum of Private Business will help you and your business keep up to date with our latest Employment Guide* for 2019. Setting up and running a business can be incredibly rewarding but there are also many problems to be faced. Not only are there economic pressures to be handled but there is a huge amount of administration, law and regulation to be understood and implemented. Any shortcomings in a company's operations may cause serious problems further down the line. That's why the right information at the right time is crucial to a business. The Employment Guide 2019 is our most comprehensive, detailed and up to the minute examination of the procedures, practices and paperwork guidelines that every business needs in order to flourish and succeed in today's competitive and challenging commercial environment. Operating in tandem with the Forum's member helpline and other business resources, it’s an essential tool for all our members. In addition to these key elements, our members' businesses have access to legal advice whenever they need it and that’s why the Forum has teamed up with rradar, a law firm that specialises not only in the expert management of legal crises but also the education and prevention in the first place. Rradar provides legal, regulatory and risk management advice and support to the Forum and, in many cases, representation to members during investigations, prosecutions, Employment Tribunal proceedings and Civil Court proceedings. If a crisis arises, radar's legal team working with the Forum can advise on how to work with the Police, HSE and all investigating and regulatory bodies. Any discussions and advice provided by rradar’s legal team are legally privileged, meaning the advice given is protected and confidential. Nobody sets up their business wanting to spend their time dealing with red tape, and here at the Forum, we know that small businesses – which make up the biggest part of the UK business community – spend on average 37 hours a month on red tape and compliance issues. Employment issues make up the vast majority of this time with over 14 hours being spent on staff and staff-related issues. The good news is that as a Forum member you receive the best possible information, advice, support and protection and our membership team take care of the complicated and confusing items that take up increasingly more of your time and requires you to seek external help. The result is - you spend less time on these issues and less money on external consultants. For a simple and affordable annual fee, your Forum membership lets you get on with doing what you do best – developing and growing your business. The Forum can certainly save you and your business time and help you comply with practical, no-nonsense advice, support and protection. Brings together everything you need to know about employment law in one easy to understand guide; from recruitment and induction to pay, absence management and dismissal. Step by step processes with easy advise making sure you are compliant in every aspect of procedures for the employment of your staff. 100+ customisable templates for you to adapt to your own business including sample contracts, letters, policies and procedures. All templates are available to download within the Members area of the website*. *** you must contact the member helpline before acting in any situation which might result in a tribunal to ensure your business is covered by our legal expenses insurance. Content is for informational purposes only and does not constitute legal advice. It is recommended that specific professional advice is sought before acting on any of the information given.